This April, history is very much on our minds, prompted by the sesquicentennial of the US Civil War, and the 50th anniversary of the first man in space, Colonel Yuri Gagarin. On April 6, history was also the theme at a Wine Media Guild (WMG) of New York tasting and lunch celebrating California’s Centenary Wineries. Organized by San Francisco-based WMG member Deborah Parker Wong (who unfortunately could not attend), the event was a fascinating time-travel tour of California winemaking via older vintages and some new releases from six iconic wineries (some predating The War Between the States! ): Beaulieu Vineyard (established in 1900), Buena Vista (1857), Charles Krug (1861), Gundlach Bundschu (1858), Schramsberg (1862), Simi (1876) and Wente (1883). Though relatively young, perhaps, in European terms, these venerable wineries (and properties) paved the way for California’s modern wine juggernaut, and have stood the test of time. And, while tasting some of California’s remarkable past, attendees entered into a lively discussion of California’s present and future, informed by the lunch speaker, Charles Krug’s Peter Mondavi. 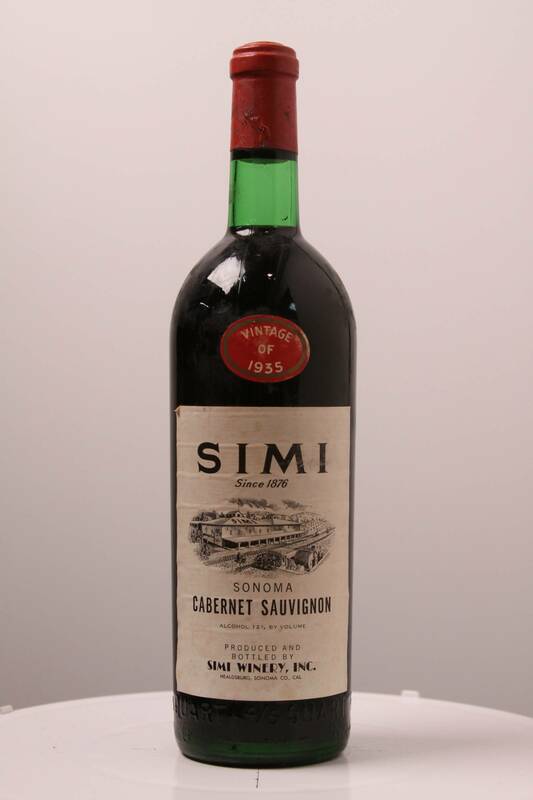 Among many highlights, the 1974 Simi Reserve Cabernet Sauvignon stood out: heady aromas – eucalyptus, sandalwood, menthol and earth – with minty black plum on a clean, persistent finish. 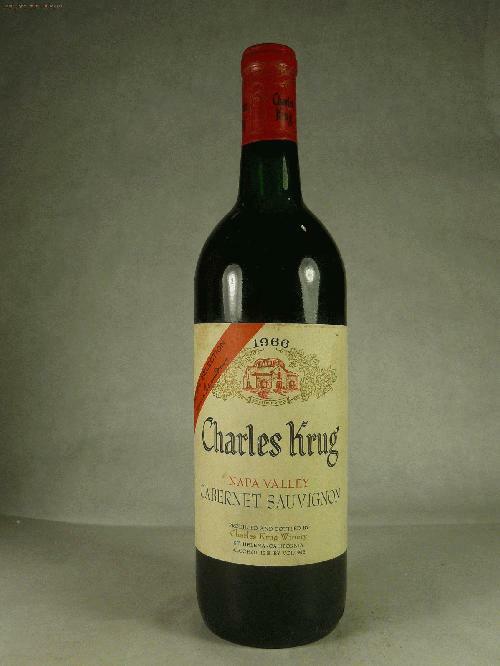 The 1966 Charles Krug Vintage Selection Cabernet Sauvignon (left) also impressed, showing a translucent reddish-brick hue, an earthy, forest-floor nose and a pure beam of red fruit. Both during the tasting and at the table, the 1982 Gundlach Bundschu Rhinefarm Vineyards Vintage Reserve Cabernet Sauvignon shone, exhibiting eucalyptus and mineral notes and solid core of black fruit. Bright and balanced, it matched well with the pork and Portobello mushroom main course. Plenty left in the tank here. 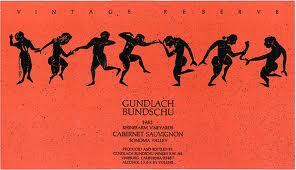 Among the current releases, I liked the pretty blueberry fruit, hint of chocolate and fine tannins of the 2008 Gundlach Bundschu Vintage Reserve (Red Blend). From casual observation, however, I perceived little enthusiasm for the newer releases among the WMG literati. Compared with the more mature vintages, of course, the younger wines require more time to integrate the copious fruit, tannins, wood and alcohol found in most. Still, many of the WMG members could not imagine the current bottlings aging in the same graceful manner as their forebears (especially with wines clocking in at over 15% ABV). Mondavi spoke to this in his remarks, maintaining that a movement — not a rebellion — towards wines of more restraint, structure and more cautious use of oak, is underway. But owing to various factors, climate change and virus-free vines among them, he said the days of 12.5% California wines are past. He also voiced doubts that today’s wines will age as well, or as long, as those from previous decades. This entry was posted in New York City, Wine and tagged Beaulieu Vineyard, Buena Vista, California wine, Charles Krug, Gundlach Bundschu, Peter Mondavi, Schramsberg, Simi, Swanson, Wente, Wine Media Guild of New York. Bookmark the permalink. Thanks for the wonderful recap, Chris, it’s helping ease the pain of having missing out. I did get the chance to taste a ’87 Don Melchor last week in Chile. Intense aromas of dried mushroom and dried fig with underlying notes of licorice and black fruit that were supported on the palate by bright acidity and complex notes of worn saddle leather.